MOBILE, AL (WNSP) — Athlon Sports released its rankings of all 130 starting FBS quarterbacks on Wednesday, and three in-state quarterbacks made the top thirty. Alabama’s Jalen Hurts and Auburn’s Jarrett Stidham just missed the top ten, landing at Nos. 11 and 12, respectively. 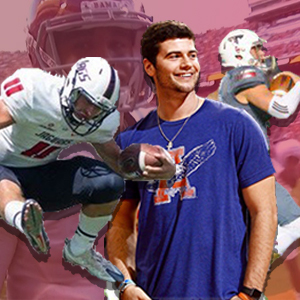 Stidham was chosen for the list even though Auburn has yet to officially name a starter. Troy’s Brandon Silvers came in at No. 28, the highest ranking for any Sun Belt quarterback. The senior from Orange Beach helped the Trojans lead the conference in Total Offense, Scoring Offense, and Pass Offense. Other in-state teams landed near the bottom of the list. Dallas Davis from South Alabama was ranked No. 97, and UAB starter A.J. Erdley was second-to-last. It’s worth noting that Davis is a redshirt sophomore, and Erdley is a JUCO transfer on an offense that has yet to play a single snap together. Those numbers could very change by August, and the two have time to develop. The top spot was taken by defending Heisman winner Lamar Jackson (Louisville), and followed by Heisman favorites Sam Darnold (USC), Baker Mayfield (Oklahoma), and J.T. Barrett (Ohio St.). Jake Browning (Washington) rounded out the top five, and Quinton Flowers (USF) was the lone Group of Five representative in the top ten. Mason Rudolph (Oklahoma St), Luke Falk (Washington St), Trace McSorley (Penn St), and Josh Rosen (UCLA) were Nos. 7 through 10. Hurts and Stidham led the SEC, followed by Nick Fitzgerald of Mississippi State and Austin Allen of Arkansas at 14 and 15. Georgia’s Jacob Eason came in at 21 and LSU’s Danny Etling was ranked No. 63. Former Bama starter Blake Barnett came in at No. 49. Barnett transferred to Arizona State after losing the starting job to Hurts. For the full list, check out AthlonSports.com.